The man texted his family that “he had joined the jihad”. GERMAN POLICE HAVE arrested a 17-year-old Syrian outside Berlin on suspicion that he was planning a suicide attack in the German capital. 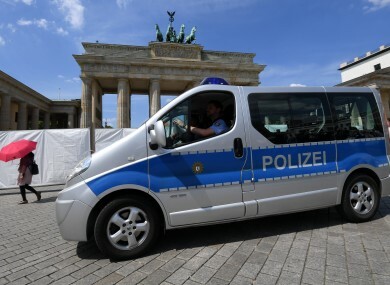 Police in the state of Brandenburg said the teenager was detained in the county of Uckermark, northeast of Berlin, after they learned he had sent a message to family members saying farewell and that “he had joined the jihad,” or holy war. “Evidence of the planning of a concrete act has not yet been identified during the police investigation,” police said in a statement. The state interior ministry’s office identified the suspect as a Syrian. The teenager, whose name wasn’t released, came to Germany in 2015 as an unaccompanied minor and registered as an asylum-seeker. He has been living since 2016 in a home for minor refugees in Uckermark. German security officials have repeatedly warned that the country is in the crosshairs of international terrorism groups. In December, a Tunisian citizen attacked a Berlin Christmas market, killing 12 people and injuring dozens. Email “Teenager (17) arrested in Germany for 'allegedly plotting Berlin terror attack'”. Feedback on “Teenager (17) arrested in Germany for 'allegedly plotting Berlin terror attack'”.